On Saturday, as I was finishing up my Mad Men Challenge dress, I was thinking about what fabrics I would like to use for the sew-along. I will most likely be choosing something from my stash because I need to use some of it up! In the afternoon, I took a break from sewing and went to Jo-Ann's to pick up a copy of New Look 6097. When I got to the pattern drawers, I almost panicked! They didn't have a divider for the pattern---they had 6096 and 6098 but not the one I needed! So I sifted through the sections and they had ONE pattern left! If you're in the Reading, PA area, you may need to have the pattern ordered in or order it online. Sorry! Before we get started sewing together, I wanted to share some thoughts about what fabrics to choose for the dress we will be making together. Some of you may already have picked out fabric and don't need any advice, but some of you may be working with knits for the first time! Whatever your experience, I'm just glad you are participating! The pattern calls for stretch knits only: jersey, matte jersey, lightweight double knits, two-way stretch. 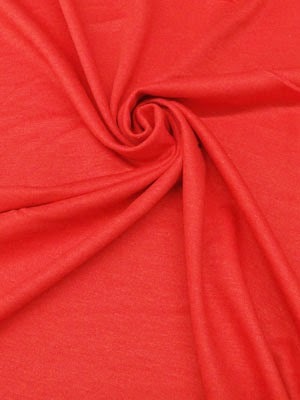 It is also suitable for fabrics with plaids or stripes. If you're new to the knit world, you're probably wondering what does this mean? 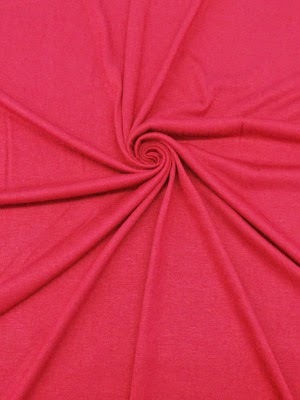 Jersey is a stretchy, single-knit fabric with nice drape. This could include: ITY knit, rayon jersey knit, cotton jersey knit, matte jersey knit, etc. 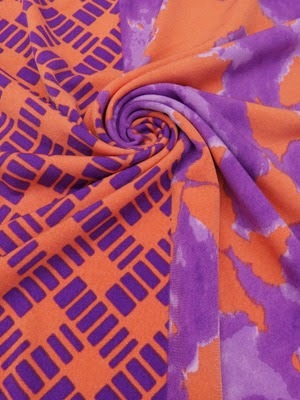 All of these fabrics usually have a nice drape and come in a nice selection of solids and prints. See how the folds of the fabric are close together? The folds show us that the fabric is lightweight with a nice drape. This is an ITY knit. This is another good example of a jersey knit, cotton/rayon/lycra. Once again you can see that the folds are close together, creating a nice drape. If you want a dress with a little more substance and sturdiness, go for the lightweight double knit. Normally double knits are stiff, with less drape than a jersey. But there are some double knits that have enough drape---a little harder to find. Below is a lightweight ponte knit. Once again, look at the folds. They are not as tight as the jerseys shown above, but still close. The folds form nice drapes. So what knits should you stay away from? Heavy sweater knits, heavy ponte/double knits, rib knits, interlock knits, activewear knits and maybe even slinky knits and burnout knits. Basically any knit that does not drape nicely. These are all lovely fabrics, but we're going for drape, you don't want anything that will make your garment boxy. So get shopping for your favorite jersey knit! We will start sewing on April 7th. 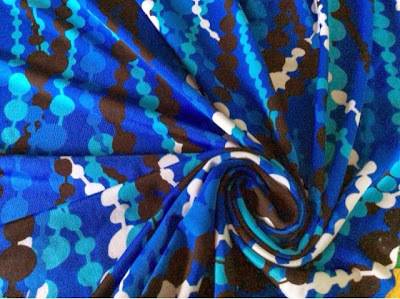 I will be creating a flickr account where you can share photos of your fabric selections and finished projects. Stay tuned to more info on that. If you have any questions comment below! I can't wait to see what you choose! Check out Fabric Mart's selection of knits now! Use the filter on the left side of the website to narrow down your search by content, type, weight, color, etc. 1) Beaded Print ITY Knit from Cache. This is an oldie but a goodie from my stash. I bought this from Fabric Mart way back when I started! (About five years ago.) How many of your seasoned customers have this one in your stash? This is a lightweight ITY knit with nice fluid drape. I love the vibrant blue color. The beaded print goes with the selvedge, therefore going with your body. 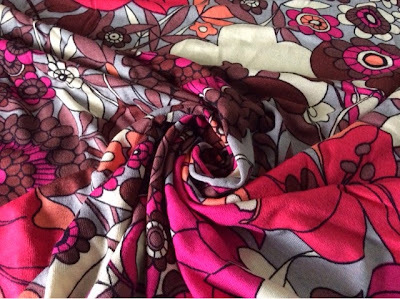 2) Retro Floral Rayon Knit from France. This retro floral print is a rayon/lycra knit from France. This was in Julie's Picks about two years ago and I think also online for a short time. I love the print as much as the colors! 3) Paint Splatter ITY Knit from Maggy London. This print was on our website about two years ago as well. 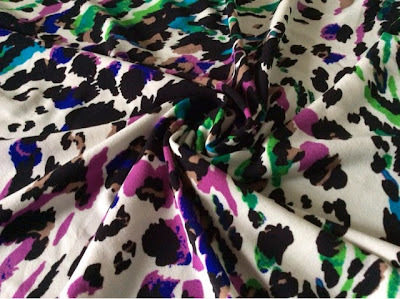 A Maggy London print never fails. I love the color combination! You have until Wednesday, March 26th to vote. You may select your favorite, but if you've never sewn with one of these fabrics before, you may want to select one you have not worked with. I will be making a muslin out of a solid cotton/lycra knit that is a little heavier than these fabrics, but still drapey. It feels more like a lightweight ponte knit. Vote now for your favorite! Voting is over. Learn more about the Reader's Pick Sew-Along here. Reader's Pick Sew-Along: Fabric Selected! Made by a Fabricista: AHOY Spring! Reader's Pick Sew Along - Vote for the Pattern! New Sewing Pattern Available at Fabric Mart!